Lisa Kay Solomon is a guest contributor to the Duarte Blog. She teaches innovation at CCA’s MBA in Design Strategy in San Francisco, and coauthored a forthcoming book called Moments of Impact: How to Design Strategic Conversations that Accelerate Change (Simon & Schuster, 2014). Resonate is one of my favorite books. As a professor of innovation at the MBA in Design Strategy, I teach its core principles of visual storytelling to all of my graduate students. In today’s complex and noisy world, the ability to tell a compelling and memorable story that influences others to be genuinely excited about your idea is arguably one of the most important leadership skills to master. Resonate readers learn that standout presentations come from their underlying story narrative perfectly tuned to capture the audience’s frequency of emotion mapped over the duration of the speech. This constitutes the simple brilliance of Duarte’s Sparkline. 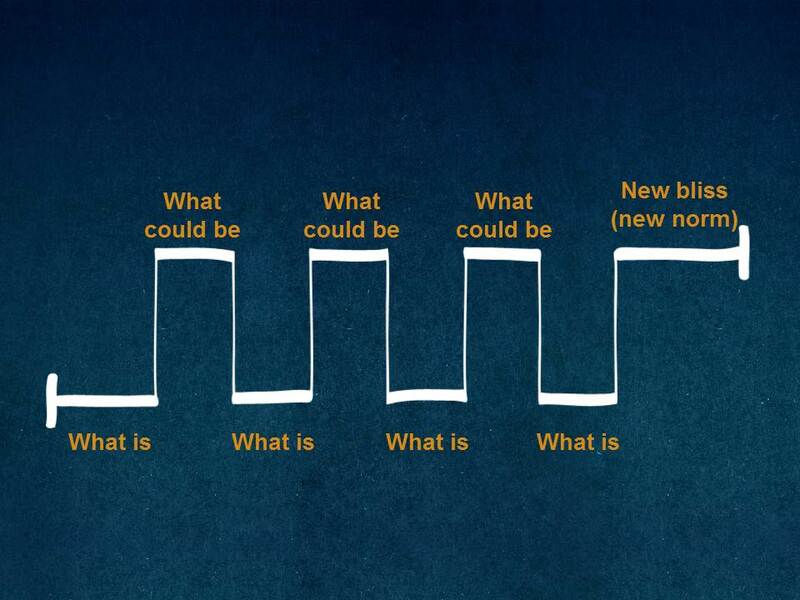 But Sparklines aren’t just the secret sauce of great presentations. They are also the foundation for designing powerful strategic conversations. Strategic conversations are creative, collaborative problem-solving sessions focused on tackling a messy, open-ended challenge. They generate novel insights by combining the best ideas of people with different backgrounds and perspectives and lift participants above the fray of daily concerns and narrow self-interest, reconnecting them to their greater, collective purpose. And they lead to deep, lasting changes that can transform an organization’s future. Like great presentations, we can design these conversations to maximize lasting impact by using a different kind of approach – one that uses both reason and emotion to engage participants and perspectives across organizational boundaries to discover insights and new ideas through a carefully architected shared experience. 1. Know what your “Call to Action” is in the context of the conversation: Is it to build understanding, to generate real choices, or to make a critical decision? Each one of those landing points is different ending and requires different design choices for how the participants will spend their time in the beginning, middle and end of the conversation. 2. Figure out who should be invited and why: Move from the “must invite” team of political insiders and past meeting participants to a diverse dream team of voices that include provocative creatives, lead customers, adjacent industry players, network connectors and industry experts. But sending an invite to diverse folks isn’t enough to secure a successful outcome. Be sure to spend some time thinking about empathically about what motivates and threatens them in order to engage their best creative contribution. 4. Set the conditions for success. Conversations don’t happen in vacuums. They happen in physical environments that either support our best work, or distract us from being fully present. Make sure to architect an appropriate space stocked with the right materials to support your conversation – seek out rooms with natural lighting and fresh air, scope out vertical wall space for whiteboarding, give sharpies and post-its to everyone for democratic ideation. When you need to create a true sand box of imaginative possibility, you DO have to sweat the small stuff. 5. Map the experience. If you were to plot the emotion of an average meeting with time on the x-axis and emotion on the y-axis, you’d likely see a graph that looked like a flat line. Passion is often intentionally checked at the door of many important conversations, because it is assumed that unchecked emotions will bring out our worst instincts, subject us to biases, and derail the meeting’s agenda. But emotionless meetings also risk something else – when participants are stuck on autopilot, the most important opportunities for true collaboration may go unrealized. 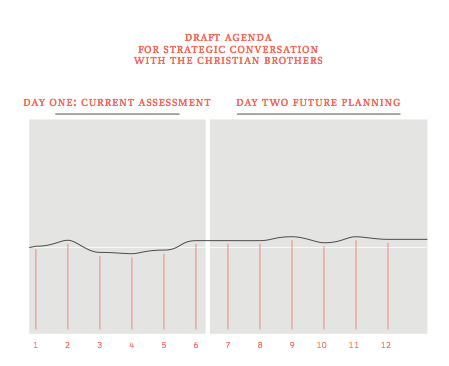 Below is a chart that maps a hypothetical two-day strategic planning offsite with the De La Salle Christian Brothers using mostly data to create a strategic plan. By contrast, emotional engagement triggers expansive thinking, connection making, and inspires action among those involved. Engaging participants’ logical and emotional selves helps realize and utilize the talent in the room, and can lift a team out of the monotony of cruise control into opened thinking where innovative ideas can be born. Here is an alternative map of the offsite, with the low representing a choice to show a difficult documentary film of a similar organization’s plight and the high as an interactive game focused on generating new options for the Christian order’s future. As a result of this intense, but impactful conversation, this order that once risked extinction due to dwindling numbers is now stronger than ever. The next time you approach an agenda for a strategic conversation, try thinking less like an air traffic controller juggling an shifting list of topics and interests, and more like a screenwriter or deejay designing an unforgettable experience for all involved. 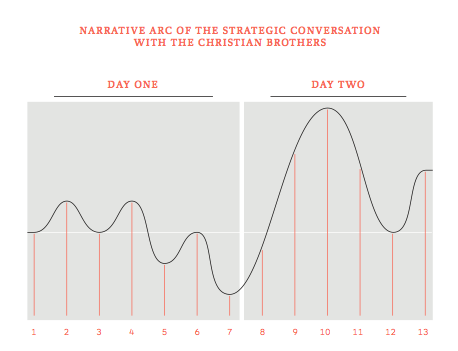 Design your conversation using the psychological and emotional arc of compelling stories as a Sparkline for deep engagement, giving participants a visceral experience of a future possibility and creating a real moment of impact.